How much does an entry door cost? That's a good question, right? This is, by every measure, one of the first and most critical questions I get from customers as they're walking through our showroom door. And, although there's a lot of variance when it comes to door prices, I feel it's my responsibility to address the topic with you right now. There are a lot of factors that will determine the cost of your door. Anything from decorative glass, to the material of your door, can end up increasing the price and contribute to your final decision. That's why I've created a condensed outline of how these different sizes, materials and glass options can ultimately effect the price of your door. There are several levels of fiberglass doors. At the low end, you'll pay around $200-$800 for a “Big Box/ Lumberyard (Stocked or Off the Shelf) door". These doors are available in stores like Lowes and Home Depot in preset sizes, and usually come with a primed or painted finish that will need another topcoat painted on after purchase. The middle level for fiberglass entry doors will cost you anywhere from $250-$10,000 depending on size, glass, painted/stained, and other selections. These "Builder Grade doors" are the most cost effective. Built to order doors have improvements in hardware design and aesthetics, not to mention there's more, design wise, you can do with these doors. The highest level of fiberglass doors, the premium level, are the best in the market. When you touch and feel these fiberglass doors, you won't even be able to tell whether it's wood or fiberglass. 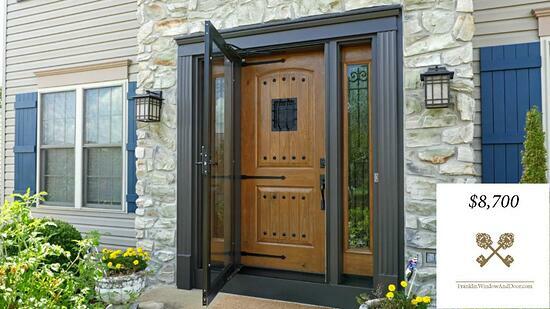 Along with an enhanced appearance, these doors have increased durability and structural support, as well. These doors start at $1,600, and can go up to $16,000, depending on a plethora of custom features. Clad wood entry doors will either have an extruded aluminum exterior (thickness of a quarter), or a a roll form aluminum exterior (thickness of a pop can) combined with a wood interior. These doors are generally full glass with energy efficient dual panes with Low E and argon gas. And, although you won't be able to purchase a clad wood entry door off the shelf, the different custom designs you can select will make this entry door one to consider. Prices range from $2,000-$20,000. Wood entry doors are still to this day one of the most popular selections for homeowners. These doors can range from $1,000-$30,000 in cost, depending on the wood species, the size of the door, and glass options. Although wood entry doors are unique and absolutely stunning, you have to consider their natural principles. In cold climates, the door will contract, and in hot climates, the door will expand. Not to mention, sun exposure can fade the wood and create more upkeep. I'd say the most widely used entry door has to be steel. Due to their cost effectiveness, security perks and purchasing ease, these doors are a popular choice among homeowners. If purchased off the shelf at a Lowes or Home Depot, these doors can be as affordable as $90. If, however, you're going with a custom steel door, with a thicker steel skin and perhaps, decorative glass, the price can go up as high as $7,000. Provia Legacy steel entry door. Wood entry doors- These doors usually have the shortest warranty, due to their natural components. Wood doors usually have around 1-2 years of warranty. Fiberglass entry doors- Fiberglass doors usually carry limited lifetime warranties with 7-10 year finish warranties if they are factory finished (painted or stained). Steel entry doors- Steel door warranties will really vary depending on the quality of the steel and the manufacturer. So, make sure to ask your dealer before purchase. Wood-clad entry doors- Generally these doors have a 10-20 year warranty depending on manufacturer. Glass components are generally 20 years for glass failure and 10 years for hardware components. The aluminum exterior finish generally varies between 10-20 years. So, before deciding on your next entry door, keep these considerations in mind. Each door has its purpose and it's important to address all of these factors up front, in an honest manner. Get the FREE 2017 Front Door Buyers Guide- Available Now for Download! Indianapolis Home Show Coming Soon!